Click on the artwork above to go to Audible for an audio sample of this story. Martin Luther was a German professor of theology, composer, priest, monk, and a seminal figure in the Protestant Reformation. Luther came to reject several teachings and practices of the Roman Catholic Church. He strongly disputed the claim that freedom from God’s punishment for sin could be purchased with money, proposing an academic discussion of the practice and efficacy of indulgences in his 95 Theses of 1517. His refusal to renounce all of his writings at the demand of Pope Leo X in 1520 and the Holy Roman Emperor, Charles V, at the Diet of Worms in 1521 resulted in his excommunication by the pope and condemnation as an outlaw by the emperor. 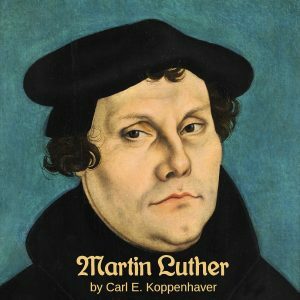 This audio provides a short biography of Luther and includes a rather detailed history of his issues with the Roman Catholic Church.